At City Wide Backflow Prevention Company, we have a dedicated team of ABPA-certified employees to serve the Metro Phoenix area for your Arizona backflow testing and prevention services. We provide backflow testing, repairs, installation, theft protection and service for temporary or permanent backflow assemblies – residential or commercial. We’re committed to your satisfaction. We’re family owned and provide quality service to every customer. We guarantee it. Our 20 years of experience means quicker turn-around times for you. Our experts diagnose, troubleshoot, repair, maintain and rebuild your backflow prevention assembly using quality parts from Febco, Watts, Wilkins, Conbraco and other suppliers. Our backflow test equipment is calibrated annually to certify that it is in compliance with both City and State governing agency regulations. Contact City Wide Backflow Prevention Company today. Call us at 480-755-0120 or Email us. Need your backflow preventer tested and certified? If you don’t need it done today, you will need it done soon. Every backflow preventer must be tested and certified after your installation and then every year thereafter. 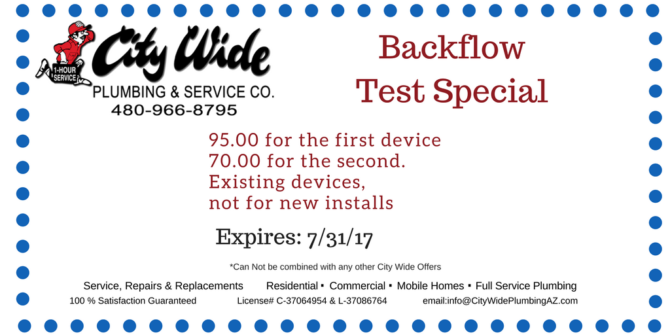 At City Wide Backflow Prevention Company, we can test repair and certify your device.